Bancroft first appeared on the stage in 1861 in Birming. After touring the country for several years he debuted in London in 1865 in "A Winning Hazzard" at the Prince of Wales's Theatre. It was managed by Effie Martie Wilton and he married her in 1868. Subsequently they managed the theatre together. Bancroft and his wife appeared in the succesful comedies by Thomas William Robertson. In 1879 they went to the Haymarket Theatre, both as managers and performars. They had made themselves a fortune and in 1885 they were able to retire from management. In 1889 Bancroft appeared next to Henry Irving and in 1897 he was knighted. From 1917 until his death he lived at the Albany in Picadilly. 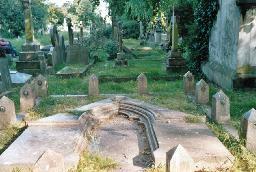 The grave of Squire Bancroft and Marie Bancroft at Brompton Cemetery, London.